A few years ago Sam Lewitt discovered the address for a high-speed data-trading facility in Mahwah, New Jersey. Having found what he called an “open secret,” Lewitt went to the facility and brought his camera with him. Euronext, a company that supplies Wall Street companies with market data, owned the building, and all he saw there were its servers and security guards, who detained him and wiped his video footage. According to Lewitt, the guards didn’t want him to have any information about points of access, security cameras, and, most importantly, the building’s cooling system. “If that were to die, the whole thing would go offline,” Lewitt told me in a recent interview at his Williamsburg studio. “I realized, at that point, that there was something in my camera, this flexible circuit structure, which already joined my camera’s technology to the servers themselves, which all have the same material in them.” In other words, Lewitt had been a part of a system before he even knew it. And that’s why, since 2013, Lewitt has been using those circuit structures to interrupt that system. Now, in an installation that will go on view this week at the Swiss Institute in New York, Lewitt will cause the circuit’s thin sheets of copper and plastic to overheat, turning the gallery into a hotbox. Called Less Light Warm Words, the work involves rerouting the energy from the gallery’s lighting system into these circuits, which are normally designed to keep objects like phones, cameras, and laptops cool. 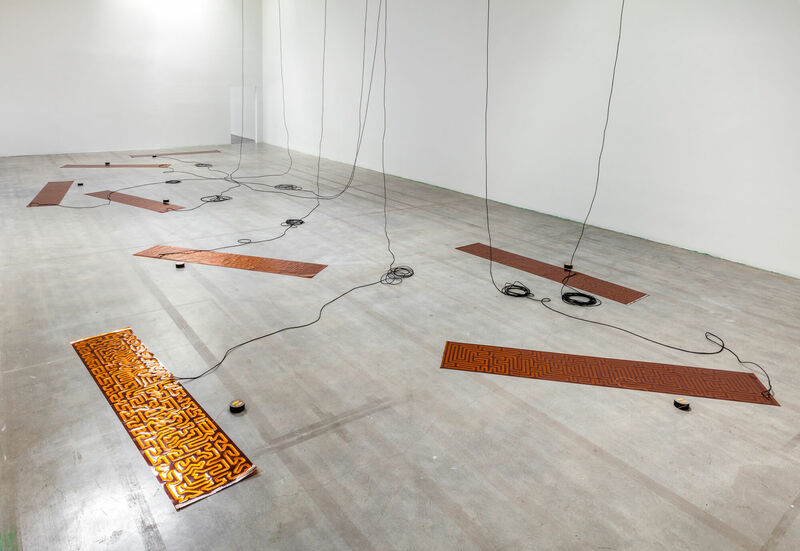 Removed from their source, enlarged, and plugged into the Swiss Institute’s electrical system, these circuits now create dry warmth similar to the kind that comes out of radiators. Hearing Lewitt talk about his work makes him sound like an artist from another era—an underrated Conceptualist, or maybe a Hans Haacke acolyte. Here’s one representative sound byte he gave me: “It really is registering the flows of the energy and power as they move through that site, and so the work just provisionally localizes those flows and thickens them into this set of homeostatic heating circuits.” In reality, Lewitt is not yet 40. He has a slender frame and matches black T-shirts and skinny jeans with white Nike Air Force 1s. Lewitt’s works examines how information is exchanged through various capitalist structures, from printmaking to currency itself. References to Hegel sometimes appear, and inspirations from Minimalism and ’70s institutional critique artists like Michael Asher are obvious. But more so than in the past Less Light Warm Words physically evokes the gallery space as a system—“an ecological object,” as Lewitt called it. And so Lewitt found the perfect location: a former light industry space that had become a creative loft, which was sometimes posted as an AirBnB for extra money. Because the space had been transformed so many times, it “echoed very nicely the way this works on a chain of conversions—you could even say ‘translations,’ ” Lewitt said.